Wait, what? Summer is here! I did not feel, smell, or sense in any other way that Summer was arriving today… 2/12/15. Silly me! All I had to do was open my eyes and see what Jimmy the Groundhog would see, if he hadn’t been sent to the corner for bad behavior ten days ago. This was at HyVee on Whitney Way today. 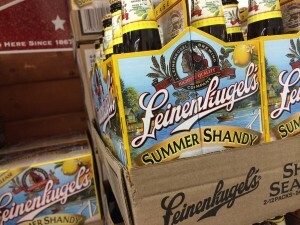 Maybe on February 2nd, we should just pull out a bottle of Summer Shandy to see if it can see its shadow or not!